So I’m going to admit that I went to last night’s Jane Addiction show with pretty low expectations. I’m not sure why I wasn’t expecting a lot. Maybe I just assumed that the now considered to be classic rock band was touring for financial reasons, or perhaps some other unknown. Boy was I wrong! The show started out with the band bursting into a strong version of “Underground” and kept rocking for an additional 5 songs after, including well known favorites like “Been Caught Steeling” stopping only briefly between songs as Perry Farrell greeted Indianapolis fans and told his story about how he had recently been in town for the Super Bowl. Also adding that he had watched the game with Joe Montana, Farrell seemed rather star struck with the Joe Montana thing, it was pretty funny. 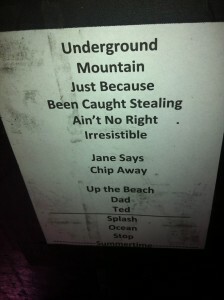 The show then took a turn toward acoustic as all of the members of the band sat front and center for the fan favorite “Jane Says” and then all members grabbed a drum for “Chip Away” only to all head back for their normal gear and a strong run of songs to finish out the show. So lets get around to the review part of this article….. The show was great, Dave Navarro still has the licks and guitar tricks to wow the crowd, Farrell still has the energy of a mid twenties rocker and the rest of the band can say the same. While Jane’s Addiction might not be the spring chickens they once were, they still possess the power of rock and aren’t afraid to use it. Seeing them in a small, intimate venue was appreciated by the fans in attendance as well. I would recommend going and seeing Jane’s if they make a stop in your town. Please Note: Ticket’s purchased at Secondary websites may be priced above or below face value, you will be buying tickets that are being RESOLD, you might get an amazing deal, or you might pay more. We recommend that you shop around for the best deal.